Dr. Mennicke and Singers in Accord will collaborate to produce a concert the features two stunning pieces of the choral canon: the beautifully melodic Requiem of French romantic composer Gabriel Fauré and the equally stunning masterpiece by Ralph Vaughan Williams, "Five Mystical Songs". The concerts will be in two recently remodeled venues: Beutow Auditorium at Concordia Unversity in St. Paul, and SIA’s new home, The Lutheran Church of the Good Shepherd in Edina, MN. Mr. Anzaldua has put together a program that explores the awe and spiritual mysticism inherent in natural phenomena –the ocean, the Aurora borealis, the sudden cloudburst. The program centerpiece is the Minnesota premier of “Oceana” written by Argentinian composer, Osvaldo Golijov based on poetry of Chilean poet, Pablo Neruda. It is written for double choir, orchestra, and jazz soloist and based on the structure of a Bach Cantata. The other pieces are, “Rivers of Light” by Latvian composer Erik Esenwalds and “Cloudburst” by American composer Eric Whitacre. Concerts will be at The Lutheran Church of the Good Shepherd in Edina. 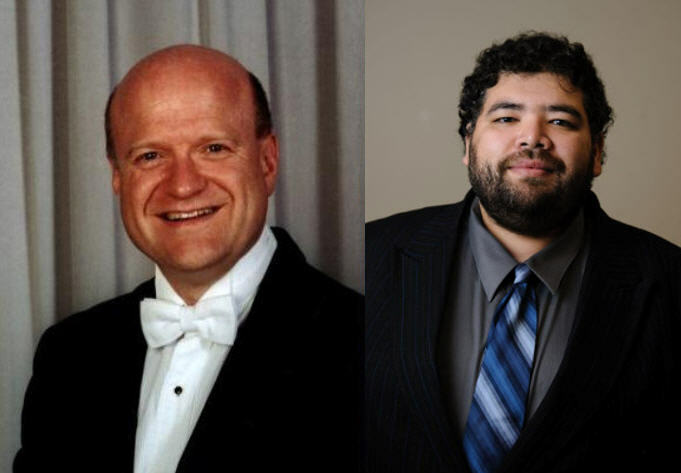 Each season allows the singers the opportunity to work with two different, top level choral conductors who are experts in that concert's genre. The season is divided into two, 10 week projects, which allows for mid-winter break around the holidays and mid-winter vacation. Fall Project: Early September through Mid-November; Spring Spring: Mid-February to through Early May. While our ensemble emphasizes excellence and high performance standards, the culture of the group is welcoming and egalitarian. You'll enjoy the people you'll be singing with. Can commit to sing for an entire concert season (preference is given to admitting these singers). Are available to rehearse Tuesday evenings from 7:00-9:30 p.m. Rehearsals are held at The Lutheran Church of the Good Shepherd in Edina [map]. Listen to selected audio samples from our past concerts. Auditions during the summer will be by appointment. We are currently auditioning men's voices - bass and tenor. Fill out the form at the bottom of this page, or call 612-597-5483 and leave us a messge. After your audition request form is submitted, a member of the SIA audition team will contact you to schedule your audition. Please tell us about your vocal experience. If you have any other relevant musical experience, or skills in any other area that may be helpful to the organization, please list them here. “I come home from SIA rehearsal with my endorphins all charged up! After singing all day (as a music therapist) you would think it would be difficult to sing in the evening, too, but actually my voice is healthier and stronger than ever due to the fine vocal collaborators who teach us so much!